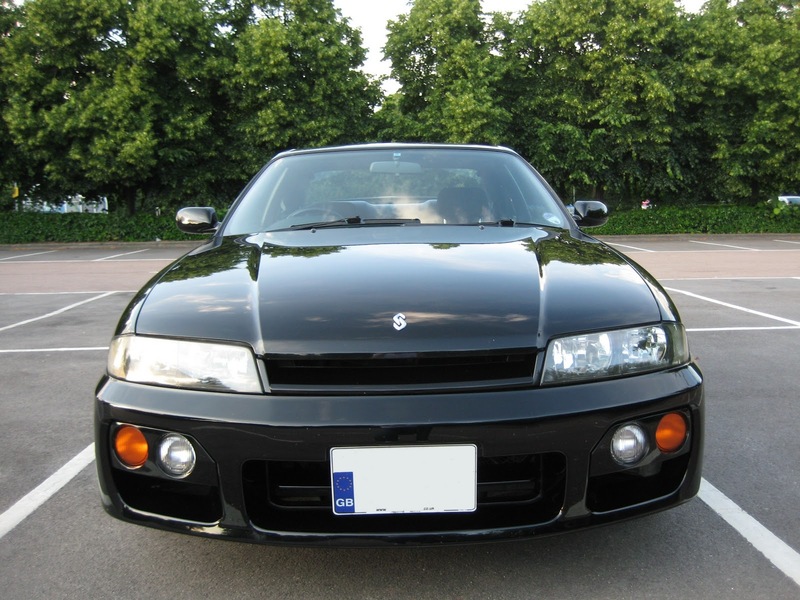 Adventures in Motoring: Skyline R33 Stock Take! Ms Skyline moves along so rapidly, she sometimes takes me quite by surprise. I thought it might be nice dear reader if I were to share a few photographs of her transition from beautiful car to um, more beautiful car! Beautiful, but different? Naturally these photo's are all out of date. But I have been waiting for the Sun to appear... I'm sure it will one day! Above we have the original nose (how she arrived) and the changed front. Originally it was the plan to fit an M spec front 'splitter' to the car (see garden post). However after cutting of the bumper to fit the intercooler the car seemed very 'blunt' on the front end and lost some character with the huge chunk of Aluminium looking out. If you are not keen on defacing and cutting up the front bumper for a front splitter, there is always the option of fitting a side mount intercooler from a R34. this however does have its drawbacks being only able (I say 'only') to handle 300 BHP. I did think about putting mesh in the aperture, although this would have looked silly and cheap. 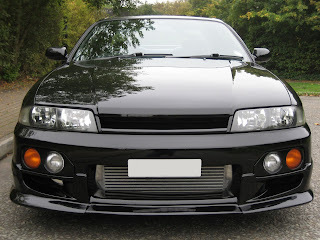 The car needed to regain it's front stance and this was done with a Knight Racer front splitter click here you will see from the advert that Ms Skyline is the star, although I would mention that she only does it for fame and no fee's were exchanged. Lowered 30mm, alloy's added, side skirts, spats and colour coded wind deflectors around window. Side views. As you can see a drop of 30mm is sensible. I have kept the standard Nissan shocks and fitted Tein springs. This gives a more pleasing look to the eye and does transform handling into and out of corners. Coil overs are not for me as it isn't a track car and the plan was to improve the car, not ruin it. The side skirts, rear spats and wind deflectors are all genuine Nissan parts. 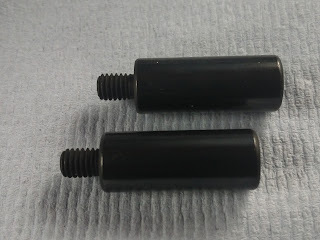 These were sourced from Tim at the Moff Shop If your in the UK or Europe, always drop Tim a line. Will add more about the Moff shop in services of note at some point. The wind deflectors come in a rather nasty shade of brown clear plastic. I had these sprayed to match the rest of the car. The side indicators (or amusingly titled 'winkers') were replaced with Nismo Clear Indicators (almost £60) and just below them you can make out the gold 'GT' badges. Lastly you would have to be blind not to notice the wheels! White dial replacements with chrome dial rings. As a part of the major modifications Ms Skyline underwent, one of the biggest was converting from an Auto to a manual gearbox (more about that saga to come). This meant that clocks and dials had to be changed as an Auto speedo is actually calibrated differently. Additional to this I would not be needing the automatic indicators for drive, park etc. So a new clock console was sourced (spec 1). White dials fitted (Andy at SPA said I was a brave man) with chrome dial rings. Fitting new dials is not for the faint hearted, you have to actually remove the needles to fit the new dials. Although more about that later. Well there you have a very basic run down of some of the changes from old to new. this isn't meant as a do it guide and is just all showboating!